djkardkreations: I Love a Pear and a Party! I Love a Pear and a Party! Oh, hi! Don't you just love waking up on a Monday morning and starting a brand new week filled with who-knows-what fantastic adventures? And double-delight, it's also the start of a brand-new month! Let's hit it! I can tell you my week is starting out great as I'm honored to be the Guest Designer for Serendipity Stamps Challenge Blog! 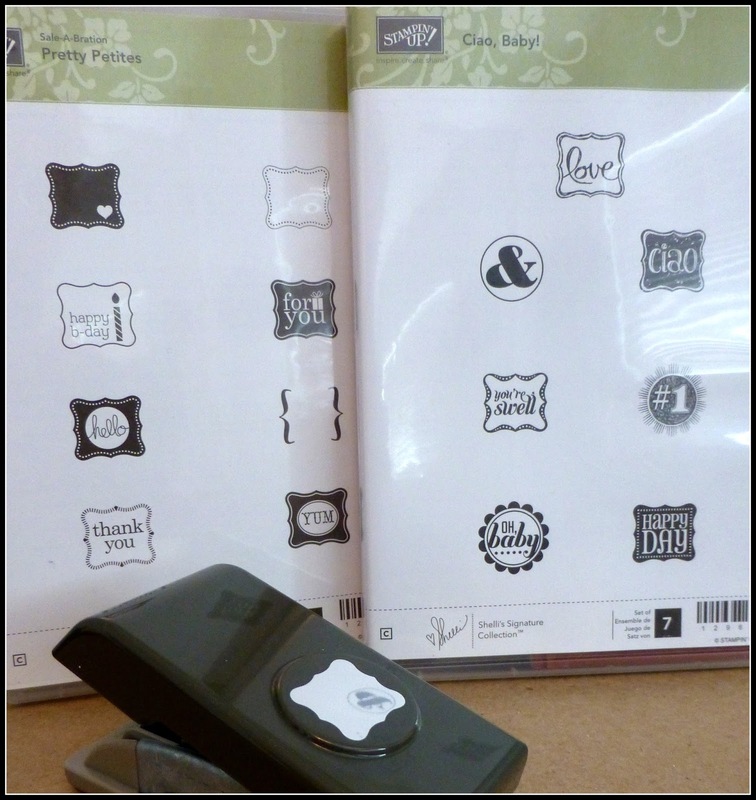 It's a pleasure to use Mary's stamps. They are deeply-etched red rubber and stamp like a dream! I know a lot of your prefer the clear stamps, but with a Misti or a Stamp-a-ma-jig, the process is EZPZ. The dies are also fun and well made and that's what I am using to inspire you today. For this first card, I'm using an older pear die, which I thought I had used before because I've had it quite a while. (Slap!) However, I can't find it on my blog or Pinterest board, so I guess it's NBUS and that's cool because I'm on a NBUS mission. It may look like I cut the pear from gold paper, but I dinnit. I smooched alcohol inks and blender onto glossy card so the whole thing is pearish and glossy. Yes, I know I've made that sound like a blended pear Marga Rita and now your mouth is salervating. Mine, too. The pear underwear is cut from a piece of watercolor smooching. I used this pear for my color inspiration! Back to the card, I'm using another NBUS Serendipity Stamps die for the sediment, die cut from the same sheet of blended glossy card. To make the Sweet word even sweeter and glossier, I layered on some Modpodge Dimensional Magic. The other bonusi are that I used some of my ribbon and pp (otherwise known as DSP to some of you) stashes! I gave myself a pat on the back and now my arm hangs funny. I hope you'll join in the challenge which lasts the entire month of February! The theme is Anything Goes, which we all love! P.S. The 50% off stamp of the month for February is this awesome tandem bike stamp! You can order the stamp here. 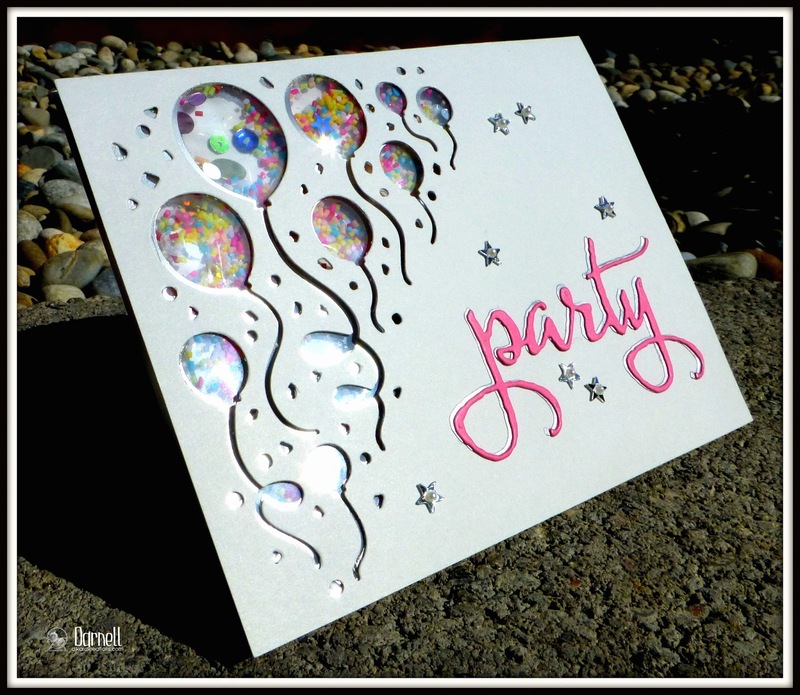 The NBUS corner balloon die was just released last month from Serendipity Stamps. 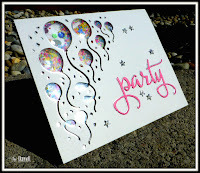 Using my We R Memory Keepers fuse tool, I turned the die into a fun party shaker card. The paper (soft stone and hibiscus burst) and shaker sprinkles are from PTI. The party sediment is from Winnie & Walter. You might be able to spy the silver linings behind both the die openings and the party word die-cut. Share Joy Challenge: See below, using both inspirations. It's not you, it's me. One more quick comment about Blogger. I have noticed my inbox notifications of your posts have dropped significantly, so I don't know when some of you have updated your blogs. I DO have a Google account, so I wasn't expecting this to happen, but apparently there is some monkey-business happening even if you already have a Google account. If you haven't heard from me for a while and suspect that I've been dropped from your followers, please let me know so I can come and refollow/ resubscribe. Head's up, a new 3-part item has been added to my GIVEAWAY page! Wish we were at a party with a pitcher of pear margaritas! Lovely detailed cards, as usual. Love that pear! You nailed the color! That fancy die-cut pear is BEE-U-TI-FULL! Love the gloss from your alcohol inks, and the smooshed underwear is the perfect colours. Combine that with the Sweet sentiment and even sweeter plaid background and it's a knockout! Awesome! And LOVE your shaker card. I'm going to have to get one of those fuse tools. This looks amazing ... and great idea to line everything in silver. Adds even more sparkle and shine. Great job with your GD cards Dolly --- congrats! I have lost followers too. I guess Google is being persnickety with everyone! Two great cards - my favourite is the shaker card - fabulous! Love your cards Darnell - the pear one is a real stunner, and the party one ever so sweet - did Hammy help with the sequins in the shaker??. Congrats on your GDT spot - it is well deserved. Good morning Darnell (well its morning over here) and a happy February to you. Gorgeous cards to start the week .... Congrats on your GD spot too. Google is driving me nuts at the moment ..... followers coming and going .... Why can't they just leave things alone. If it ain't broken don't fix it and all that!! Hi Darnell, Both lovely cards. Congrats on get the DT spot. Well what do you know!!!! Mr Hettie went shopping on his way home from work this morning and bought pears, which is unusual for him, and here you are showing yours off!!! Wowzer!!! Liking yours, though like mine as I can eat them. Don't s'pose alcohol inks taste very nice!! Loving your party card too. Shall we have one at the Playground later? Two fab cards Darnell, love the balloon shaker card! Oh Darnell - what a fabulous per card - that die is really terrific and the shape and colour does match your real life pear so well :) A pair of pears? Great party card too - I have parties on the brain here. Did giggle about the pat on the back and your arm hanging funny - wiping peppermint tea from the laptop screen here now! Congrats on the GDT! These are gorgeous! LOVING the pear and the balloons!!!!!!!!!!!!!! Two fantastic cards Darnell. That pear looks too good to eat and certainly very yummy and your ribbon is beautiful. The second card really shouts out "Celebrations". What a great shaker this is. Congrats on being chosen to be a guest designer. You did them proud with this awesome card! I like your shaker card too. Did you know that you are an enabler? Because I liked the shaker card that you sent me so much...that I purchased a fuse tool. However, so far it would qualify as NBUS. I guess I should learn how to use it. The pear card is sweet. I love the filigree die and the bright color. The alcohol inks make it so shiny. The party card makes me want to party. All those fun colors and happy balloons. Whoo hoo. Your pear card is very sweet. 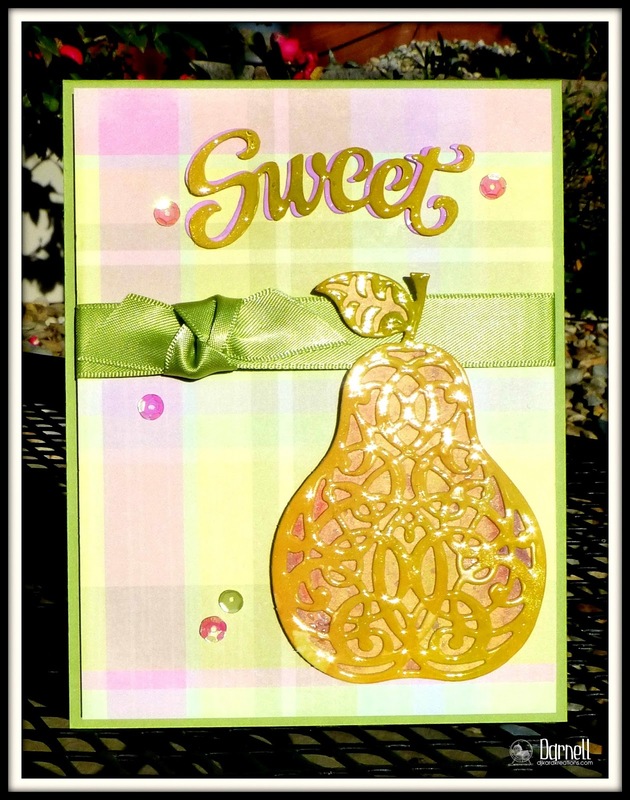 Love the pastel plaid, makes a perfect background to make that gorgeous pear pop. The balloon party card is really festive. Two great cards Dippy. 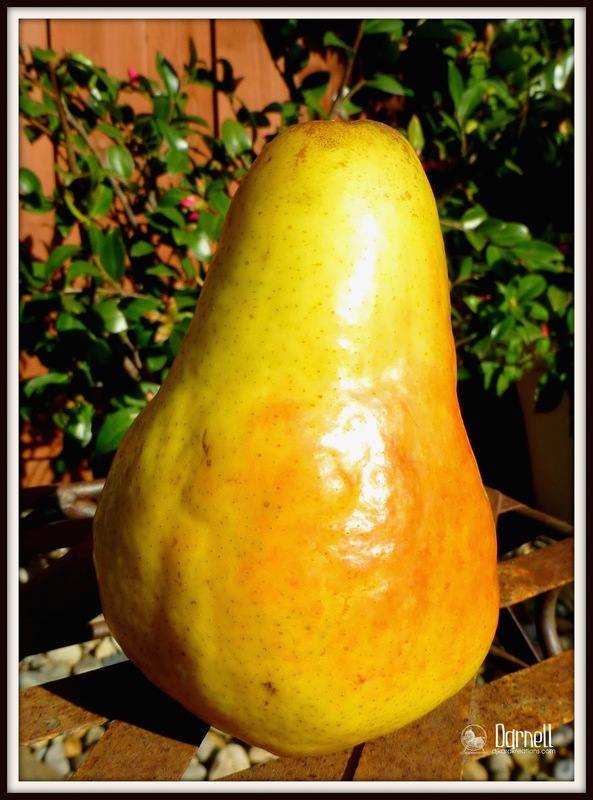 Couldn't believe it when I saw the photograph of the pear you took your colour inspiration from...........it's an amazing piece of colouring and matches the pear perfectly. Your balloon card is also wonderful - I'm just waiting for my Fuse tool to arrive so hopefully you will be seeing some shaker cards from me soon. I lost 3 followers in one day and I felt kinda bad,like I did something wrong....I'm going to hope it's a blogger thing and not take it personal,have a great week and yes I do love Mondays too! Greetings Darnell, the colors on your pear are fabulous. The shaker card design with all the fun balloons is a very clever idea. Congratulations, Darnell, on your Guest Design feature! Both of your cards are gorgeous! I'm especially enthralled with the party shaker! Woohoo! Love it! Happy February! First of all that is one gorgeous pear! And second of all looks like the party is at your house with a whole lot of shakin' goin' on! Fabulous party balloon card! Gotta tell you true Darnell.. you did get my mouth watering with the pear! I love the shine you got on that baby and dang, but now I need to buy some Modge Podge! I was sure you were going to say glossy accents! The second card with the party balloon shakers is amazing! First time I've seen that die as a shaker and it's gorgeous! Total party going on! SO happy to see you guesting at Serendipity! Pinning your projects to save for later!! Pear Margarita left overs.. who'd a thunk it? Congrats, oh mighty Guest Designer. Both your contributions are certainly... well...Sweet! Reminds me to get those alcohol inks out and play with glossy paper. Look at you, using your fuse tool, DSP, ribbon and NBUS. Your really ARE on a mission. I'm impressed. Both gorgous cards Darnell, Especially love the balloon shaker card. Great card, Darnell! 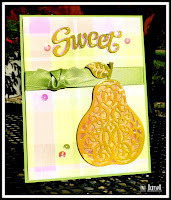 That pear die cut is one of my favorite Serendipity dies! You made it look beautiful! I love both of the cards you made. I am a fan of pears too! And, what a darling party balloon shaker card you created with that die. That is awesome too! The first card is very cute. The second card is great shaker. I like all the color of the card combined with an ascetic, elegant white. Sentiment beautifully complemented card. 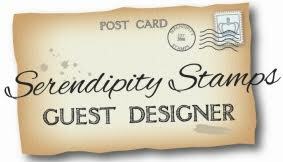 Your card is so cute, I'd like to have this die from Serendipity. That pear is gorgeous Darnell, you really showcased the die beautifully. Congrats on the guest DT spot. It's well deserved! Love both your cards. Big congrats for your GD!! Both your cards are so fun, the shaker with these balloons is a great idea and the pear looks just gorgois! Darnell, such gorgeous cards and as always, I love visiting you and reading your blog posts - they really make me chuckle...have a great week. You had indeed lots of reasons to pat yourself on the back with using a NBUS die, PP, and a ribbon on the first fabulous card! And the balloon shaker is great fun! Love your gorgeous pear, so pretty in gold. Love your inspiration photo too, it looks yummny. That balloon shaker card is wonderful. Love it. Oh, I forgot to tell you how I love your fun balloon card! What are those delicious ingredients!? Sweet pear of CA! Love the card and the inking to get the color (can I have the real pear now that you're done with the card?). JK Great Party card too. Congrats on being guest designer. Your cards are super fun and I am sure you had a good time creating them. I have yet to make a shaker card so no nothing about a fuse tool. I love the balloon card! I am really needing the fuse tool. I like how you used watercolor and alcohol ink to make this pear! Great patterns! You know I love the shaker balloons. That card looks like a party in progress! Your cards are amazing! I love how you made that pear shine! The balloon share card is so fun! Always so fun to visit your blog! Congrats on being the GD, my friend! Beautiful use of alcohol ink & I love the festive balloon card! Congrats on being the GD. Wonderful pear card. I love your both card, especially the shaker card, it is fantastic! I just love reading your posts ... I'm still chuckling! Fabulous cards! Your pear is so glossy and just look at all those sprinkles in the balloons!! Rocking those challenges Missy! Sorry Ive been missing but I've been chasing my tail lately. I'm such someone's already said "Nice Pair" which could relate to your two divine cards (esp love the party shaker) or your fruity creation. You're such a talented gal! Ps......yes, some of my cards have been on TV courtesy of my friend John (Johnnextdoor blog) who works for a major UK craft company. 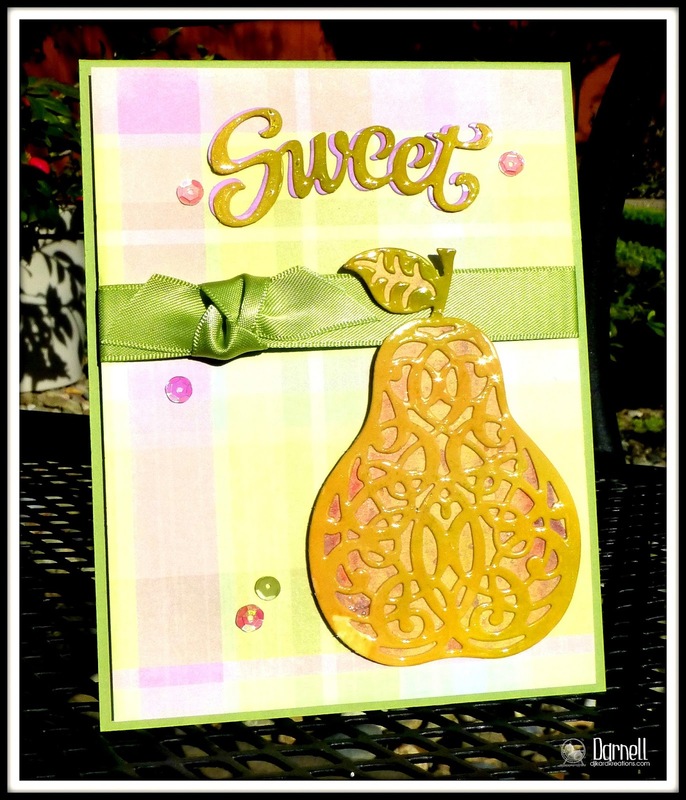 The pear is very, very, very nice, it is a fantastic die and your colouring of the die cut looks so realistic! The balloon party card is a delight too, great colours. Congratulations on your GDT spot too. Mmmm! MmmmM! MMMM! That golden pear looks good enough to sink my teeth into. Fun shaker card too. Cheering and applauding your GD role at Serendipity...and WOW! You've done these stamps and dies proud! You've translated the colours of the 'real' pear to yummy perfection! 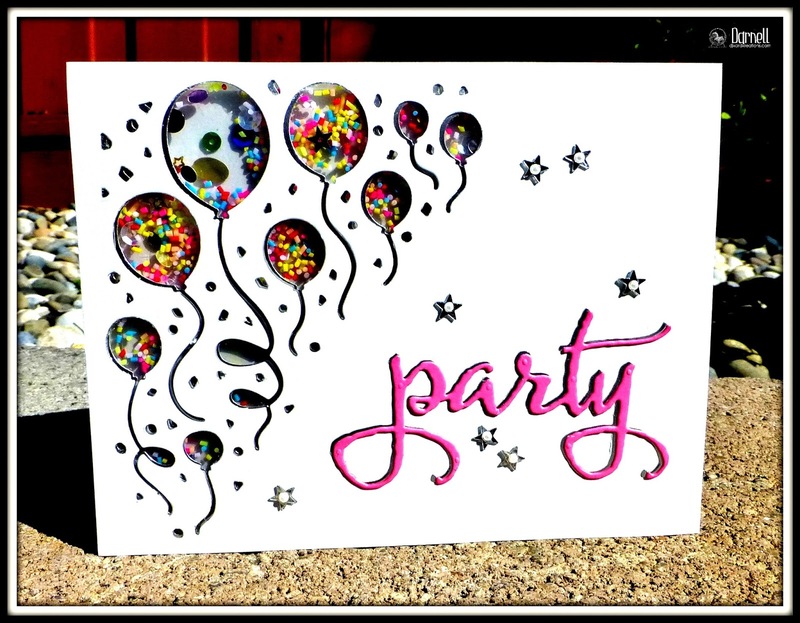 Your balloon party card: ACK! I want to give it a shake, shake, shake and listen to those sprinkles rock n' roll! Yes...a peary-wonderful post, indeed! Wow, that is some pear die!!! All that glossy color and shine really makes it a stand out...and you've captured that pear skin texture just perfectly. What a great idea to use alcohol inks to color the glossy die cut just so (I noticed that you colored the stem and leaf part green and the pear in yellows!). My favorite card is that festive shaker, which looks like it's filled with candy cupcake sprinkles! 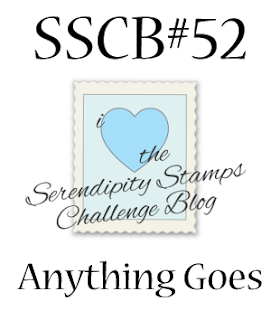 I'm going to have to check out Serendipity stamp dies now that I've seen this fun stuff! Love the cheerful balloon card!!! Congrats on the GD spot!!! You are so creative! Two beautiful cards. Love the yummy warm colors of your pear card, and the balloons shaker is just too cute! Fantastic interpretation of the pear, wow! Two great cards. What a great pear ; both I mean! They look like the taste great both :) Congrats on being GD! Your card is a beauty! And the second is a beautiful and fextive one; think in every age this card is perfect! Wish you a good start of the fresh month! Hi Darnell! First of all, congrats on your Guest Designer spot, what a great way to jump start the month and week! Your pear looks yummy, in fact they both look yummy :). I definitely have to give a try on my alcohol inks, love the vibrant colors and shimmer. Love the shaker balloons too! Great cards, Darnell! I especially love your gorgeous pear! Definitely a 'pear-fectly' awesome card, look at you rocking the techniques! Love your super fun shaker too! Congrats on being the February guest designer Darnell! "SWEET" pear! Time well spent creating your glossy 'pearish' image cuz it is awesome!!! Plaid paper (especially pastel plaids) is my second love next to polkie dots! Darnell, your pear card is so elegant (as only pears can be ;-) Love the pretty pastel plaid background. Those balloons are screaming PARTY in the most festive way. Wowza, that balloon shaker card is something else! My patience runs thin when just doing ONE image, but you've outdone yourself! Anyone would love to receive this sparkly creation! So happy you shared it with us this week at the Players! Oh my, that is one gorgeous pear, Darnell. I didn't know you used alcohol - inks that is. ;) Your party card is shakerific and makes me want that fuse tool even more. Love both of these Darnell - the pear is so glossy it looks good enough to eat and the tiny sprinkles in the balloons are gorgeous - I need to get me some of these!! 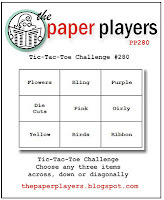 Thanks for joining us for tic-tac-toe over at The Paper Players this week! Both cards are lovely but it's the PP card that's my favourite. The corner punch is wonderful and to have turned it into a shaker card - genius. Girl...I don't know how you keep up with the comments!! Love this pear and a party...so happy you are playing along this month!! Now that is one yummy pear, na - two yummy pears and a fun balloon card! Seriously amazing cards Darnell! The pear is just stunning and a shaker card designed to bring a smile! These are so pretty, Darnell! I love all the little balloon shaker elements on the second. 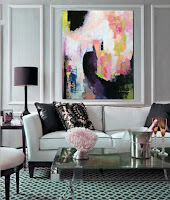 So happy to have you with us at Serendipity this month! Love these two, Darnell. The sweet pear is making my mouth water and that corner balloon punch is too much FUN on your party card!